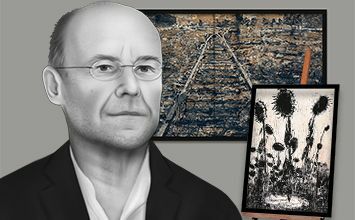 The below artworks are the most important by Anselm Kiefer - that both overview the major creative periods, and highlight the greatest achievements by the artist. Artwork description & Analysis: For his notorious first body of work, Kiefer created a series of photographic self-portraits that confronted, head on, the history of Nazi Germany. Dressing in his father's military uniform and posing in the Hitlergruss salute, Kiefer had his photograph taken in various politically significant locations in Switzerland, France, and Italy, including national monuments and classical ruins. This photograph shows the artist with his back to the viewer, facing the sea in a Romantic posture inspired by the German artist David Caspar Friedrich. As in Friedrich's painting Wanderer Above the Sea of Fog (1818), Kiefer's image depicts a man with his gaze turned outward, simultaneously dominating the landscape before him while being engulfed by it. By posing in a traditionally Romantic stance and extending his arm in the Nazi salute, Kiefer connects these two seemingly disparate periods of German history to suggest that Germany's love of country has been an enduring part of their history at least since the early-19th century. The imperialist and nationalistic attitudes of the Romantic era, instigated by Napoleonic invasions, were manipulated by the leaders of the Third Reich, leading to the tragedies of the Holocaust. While this work is stylistically very different from his later work, this series introduced themes that would become central to Kiefer's explorations of Germany's legacy and national trauma. Kiefer presented Occupations in his first solo exhibition at the Galerie am Kaiserplatz in Karlsruhe, Germany in 1969. 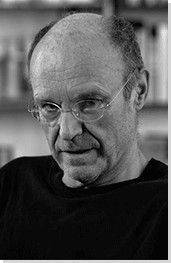 Although his mentor, the artist Rainer Kuchenmeister, praised the work, the exhibition received negative criticism from Kiefer's colleagues and from the wider German public. Artwork description & Analysis: Exhibited at the German Pavilion at the 1980 Venice Biennale, this monumental painting created controversy and was met with widely conflicting opinions. The painting depicts a cavernous, empty wooden room reminiscent of medieval architecture with tapers burning at intervals along the wall. The barren space leaves the existence of the German heroes mentioned in the title in question, perhaps implying instead that national identity must be rebuilt from scratch after the catastrophic events of the Holocaust. Some critics missed the irony of the title, German Spiritual Heroes, and thought the work encouraged a pervasive fascination with German culture, while omitting the legacy of the nation's brutality. Others saw it as a meditative reflection on German history and the country's reaction to its recent past. Artwork description & Analysis: Kiefer has stated that "our stories begin in the forest," so it is not surprising that forests are a recurring subject matter in his work. The theme is rich with meaning for the artist, particularly as a representation of German national identity as far back as the Teutonic era. It is this period that Varus references: the battle in the Teutoburg Forest, where in the year 9 BCE Hermann (Arminius), a deserter from the Roman army, in alliance with his native Germanic peoples, wiped out the Romans under the command of Varus, who fell on his sword after watching his men be massacred. The humiliating defeat was described by Tacitus in Annales, whose Germanica was rediscovered in the 15th century and came to form a bedrock of German identity as a people of superior virtue with an almost mythical bond to their land, a people who defeat those corrupted by cosmopolitanism. Artwork description & Analysis: One of Kiefer's best-known works, Margarete deals with themes related to memory, loss, and German history. As the culminating piece in a series, the painting is inspired by Romanian poet Paul Celan's searing work "Death Fugue," which recounts his incarceration in a Nazi concentration camp. Centering on two female characters - the Aryan-German Margarete and the Jewish-German Shulamite - Celan constructs a powerful account of the Holocaust, in which the fates of these two women are intertwined. Continuing his interest in literature and his use of text throughout his work, Kiefer transfers Celan's literary tropes into the visual arts to encourage the viewer to reflect on the tragedy of the Holocaust. In the poem, Margarete is blonde, symbolized in the painting by straw, which became a recurring medium for Kiefer, but which is used here for the first time. Drawn to its ability to be twisted and burned, Kiefer used straw for its symbolic reference to life cycles, racial purity, and the German love of land. Furthermore, its pliable, sinuous, and fragile materiality alludes to the tenuousness of life and inevitable decay. Straw also refers to the German legend of Rumpelstiltskin who spun straw into gold, much like an alchemist. Artwork description & Analysis: Continuing Kiefer's interest in the creation and transmission of culture and ideas, this work considers themes related to books, a motif that recurred in Kiefer's sculptural works during the 1980s as he explored knowledge and its suppression under fascism. It was also in the 1980s that Kiefer expanded his interest in history beyond Germany to a more general interest in culture and civilization. Artwork description & Analysis: Kiefer's massive sculpture visualizes creation as put forth in the Kabbalah, a collection of ancient Jewish mystical writings that describe the attributes of God as divided among ten vessels that were not strong enough to contain them. When the vessels were broken, only the virtues of Will, Wisdom, and Understanding remained while those pertaining to spiritual, moral, aesthetic, and material values were let out into the world - a world outside God's immediate control. The breakage symbolized the introduction of evil and the human condition into the world. Artwork description & Analysis: Representative of his very large landscapes, Bohemia Lies by the Sea features a rich, complexly interwoven group of symbols, alluding to themes of death, utopia, and renewal. The title has multiple possible meanings. It references the poem by the Austrian poet Ingeborg Bachmann, in which the writer details the yearning for utopian society while lamenting its fallacy. It also refers to German Bohemia, now part of the Czech Republic, that was disputed territory after World War I until annexed by the Nazis in 1938. The monumental composition, divided directly down the middle by a dirt road, is typical of Kiefer's large-scale works that seem to engulf the viewer with their immensity as if to include the viewer as part of the scene. Artwork description & Analysis: An uprooted palm tree, preserved in resin and fiberglass, lies on its side. On the wall hang 39 multimedia "vitrine" paintings that include palm fronds, seedpods, and dried roses arranged on parched soil. The paintings also contain the words "Palm Sunday" in various languages interspersed with verses from Isaiah, the Ave Maria, and The Crusade of Hercules. First published on 08 May 2015. Updated and modified regularly.